Novelty proudly supports and contributes a portion of sales on specified products to charitable organizations. Use For Watering Plants and Flowers. 27 inch x 10 inch x 12 inch. Designed with classic lines in a variety of shapes and sizes. Features a deep root zone helping plants stay vibrant and healthy. Made in the usa. .
Deluxe watering can features marks for easy measuring. Long-lasting plastic construction. . . .
• Made Of Lightweight, Durable, Fade-Resistant Plastic, Coded For Recycling. 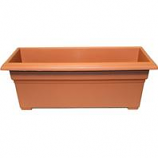 • These Traditional, Raised-Panel Plastic Planters Are Available In Three Popular Colors and Four Versatile Sizes. • Sturdy Planters For Use Alone, Inside Wooden Boxes and Wire Hangers. • Lightweight, Durable, Fade-Resistant Plastic, Coded For Recycling. • Knockout Plugs For Drainage. • Lightweight, Durable, Fade-Resistant Plastic. • Countryside Styling With Matte Finish, Satin Band, and Molded-In Feet. • Removable Drainage Plugs For Better Plant Growth. • Countryside Planters Bring Beauty To The Outdoor Living Space Of Every Style Home. 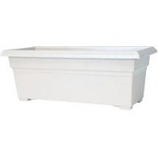 • Deep Design Square Tub and Rectangular Patio Planter Sizes Available. • Countryside Styling With Matte Finish, Satin Band and Molded-In Feet.